Serotonin… a word that brings to mind commercials showing happy brain neurons bouncing serotonin between them. There is a lot more to this molecule than most of us realize! About 90% of serotonin is made in the gut and regulates motility there. [ref] Serotonin also regulates other functions such as in bone mass, cardiovascular health, the endocrine system, and appetite. as a neurotransmitter, sending a chemical message between neurons. Serotonin, also known as 5-hydroxytryptamine or 5-HT, is synthesized from the amino acid tryptophan using tryptophan hydroxylase (TPH1 and TPH2 gene). It is transported by SLC6A4, which is also known as SERT or sodium-dependent serotonin transporter. 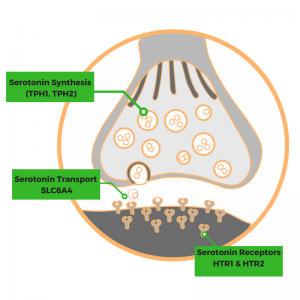 The serotonin signal is received by serotonin receptors on the cell membrane: HTR1A, HTR1B, and HTR2A. All of these work in concert: from the creation of serotonin from amino acids to the transport of serotonin to the receptors that are necessary to receive this chemical messenger. Below is a compilation of studies on genetic variants that affect serotonin. It is not an exhaustive list; instead, treat this as a starting point for you to find out more about your genes. Tryptophan hydroxylase is an enzyme that catalyzes the reaction that produces serotonin from the amino acid tryptophan. Iron is a co-factor, and BH4 is also used in the reaction. TPH2 works in the central nervous system. A good overview of TPH2 can be found in the introduction of this study which also explains the link with GABA levels as well. Several TPH2 genetic variants have been linked to psychiatric issues such as obsessive-compulsive disorder, depression, and bipolar disorder. These variants affect the rate at which serotonin is being produced in the brain. SLC6A4 is the gene that encodes the serotonin transporter. It is also called SERT or 5-HT/T in some of the research. The 5-HT/TLPR variant is a variable number tandem repeat. This just means that there is a short version of the gene and a long version – due to repeated parts of the gene. Lots of researchers have studied the 5-HT/TLPR short/short and long/long forms. 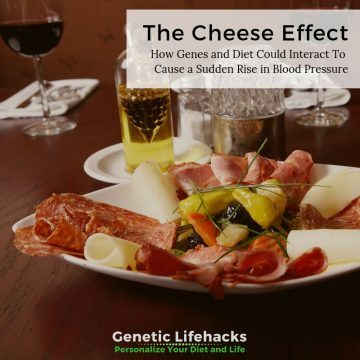 Initial studies in the ’90s and early 2000s found that those with the short version of the gene were more prone to depression due to stressful events. Here is a nice article summarizing the research that has been done on this gene: Controversial Gene-Depression Link Confirmed in New Study. Variable number tandem repeats are not included in 23andMe or AncestryDNA data, but there are SNPs that usually go along with the serotonin transporter repeats. So you can get a pretty good idea of whether you carry the long or short version. A couple of studies have found that two SNPs predict the long or short version of 5-HT/TLPR fairly well – around 95+% of the time. [ref][ref][ref] These are found in both v.4 and v.5 for 23andMe data. While there is still debate among researchers on this topic, one recent paper explains that the function of the brain serotonin receptors is to moderate stress and anxiety through patience and coping. The HTR1 receptors are thought to mediate the ability to tolerate a source of stress, ‘passive coping’. The HTR2 receptors mediate the ability to actively cope and improve one’s ability to change due to adversity. The HTR1A variant rs6295 is also known as C(-1019)G. In the plus (23andMe) orientation, C is the minor allele, but most studies use the minus orientation and will note G as the minor allele. Note that this is a very common variant with almost half of most populations carrying the minor allele. The HTR1B gene codes for another serotonin receptor. One well studied genetic variant is rs6296. Again, in the 23andMe orientation, G would be the risk allele, but when you read through the studies, it will refer to C as the minor allele. The serotonin 2A receptor (HTR2A) also has several well-studied variants including rs6314, also known as C1354T. In the plus orientation (23andMe), A is the minor allele. Below are evidence supported ways of affecting your serotonin levels. If you are needing psychiatric help, please be sure to contact a health care provider! A good overview of the gut-brain axis and the recent research on the effect of gut microbes on mood and anxiety can be found in the March 2018 journal article “Vagus Nerve as Modulator of the Brain-Gut Axis in Psychiatric and Inflammatory Disorders“. There are quite a few clinical trials showing that specific probiotics are effective for depression and anxiety (whether due to serotonin problems or other reasons). One clinical trial for postpartum depression found that Lactobacillus rhamnosus was effective. [ref] another clinical trial in IBS patients with depression found that Bifidobacterium longum reduced depression but not anxiety. [ref] A clinical trial using Lactobacillus casei, acidophilus, and Bifidobacterium bifidum found a significant decrease in depression scores. [ref] One probiotic that has worked well for me is the Renew Life Ultimate Flora that combines several strains of Lactobacillus and Bifidobacterium. I’m happy that you included links to the 23andme site, saved me from having to do it myself, just wish they looked for more of these snps. most were not determined. Debbie Moon, thanks! And thanks for sharing your great posts every week! I love this information! It is very helpful! I am confused, however, on how you breakdown the 5HTTLPR long/short genes. The chart overlaps the probably long and probably short genes in both columns. How do I tell if my T/T is long, short or mixed? How do I know if my A/G is long or mixed? Thank you for the information! It is helpful. I am, however, confused on how to read the genotype for 5HTTPLR. The first column shows that T can be probably long or short, and same with A. If I have a T/T and A/G, is it long, short, mixed? How would one intrepret the results? You would have one long and one short – so yes, it would be mixed.